The ELM-2221 - STGR (Search Track & Guidance/Gunnery Radar) is an operating in X- and Ka-Band fire control radar. 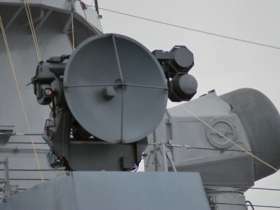 The radar uses a transmitter fitted with a Traveling Wave Tube (TWT) and a Cassegrain antenna. The dual-band version uses the Ka-Band for very accurate tracking, and the X-Band to illuminate the aim for semi-active missiles. The radar may also be delivered as single-band radar operating in X-Band only. It got the designator ELM-2221X then. Each configuration includes TV or TV+IR package.